In the first chapter of this book, the concept of an atom was discussed, as being the basic building-block of all material objects. Atoms, in turn, however, are composed of even smaller pieces of matter called particles. Electrons, protons, and neutrons are the basic types of particles found in atoms. Each of these particle types plays a distinct role in the behavior of an atom. 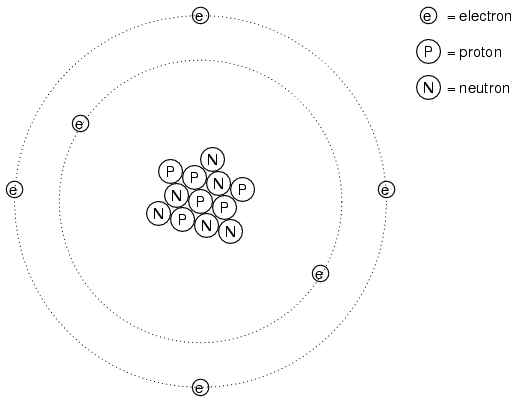 While electrical activity involves the motion of electrons, the chemical identity of an atom (which largely determines how conductive the material will be) is determined by the number of protons in the nucleus (center). The protons in an atom's nucleus are extremely difficult to dislodge, and so the chemical identity of any atom is very stable. One of the goals of the ancient alchemists (to turn lead into gold) was foiled by this sub-atomic stability. All efforts to alter this property of an atom by means of heat. light, or friction were met with failure. The electrons of an atom, however, are much more easily dislodged. As we have already seen, friction is one way in which electrons can be transferred from one atom to another (glass and silk, wax and wool), and so is heat (generating voltage by heating a junction of dissimilar metals, as in the case of thermocouples). There are several types of chemical bonds, the one shown above being representative of a covalent bond, where electrons are shared between atoms. Because chemical bonds are based on links formed by electrons, these bonds are only as strong as the immobility of the electrons forming them. That is to say, chemical bonds can be created or broken by the same forces that force electrons to move: heat, light, friction, etc. When atoms are joined by chemical bonds, they form materials with unique properties known as molecules. The dual-atom picture shown above is an example of a simple molecule formed by two atoms of the same type. Most molecules are unions of different types of atoms. Even molecules formed by atoms of the same type can have radically different physical properties. Take the element carbon, for instance: in one form, graphite, carbon atoms link together to form flat "plates" which slide against one another very easily, giving graphite its natural lubricating properties. In another form, diamond, the same carbon atoms link together in a different configuration, this time in the shapes of interlocking pyramids, forming a material of exceeding hardness. In yet another form, Fullerene, dozens of carbon atoms form each molecule, which looks something like a soccer ball. Fullerene molecules are very fragile and lightweight. The airy soot formed by excessively rich combustion of acetylene gas (as in the initial ignition of an oxy-acetylene welding/cutting torch) is composed of many tiny Fullerene molecules. When alchemists succeeded in changing the properties of a substance by heat, light, friction, or mixture with other substances, they were really observing changes in the types of molecules formed by atoms breaking and forming bonds with other atoms. Chemistry is the modern counterpart to alchemy, and concerns itself primarily with the properties of these chemical bonds and the reactions associated with them. This process of the cell providing electrical energy to supply a load is called discharging, since it is depleting its internal chemical reserves. Theoretically, after all of the sulfuric acid has been exhausted, the result will be two electrodes of lead sulfate (PbSO4) and an electrolyte solution of pure water (H2O), leaving no more capacity for additional ionic bonding. In this state, the cell is said to be fully discharged. 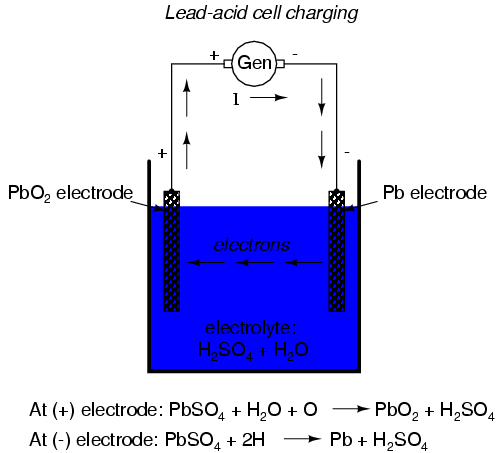 In a lead-acid cell, the state of charge can be determined by an analysis of acid strength. This is easily accomplished with a device called a hydrometer, which measures the specific gravity (density) of the electrolyte. Sulfuric acid is denser than water, so the greater the charge of a cell, the greater the acid concentration, and thus a denser electrolyte solution. There is no single chemical reaction representative of all voltaic cells, so any detailed discussion of chemistry is bound to have limited application. The important thing to understand is that electrons are motivated to and/or from the cell's electrodes via ionic reactions between the electrode molecules and the electrolyte molecules. The reaction is enabled when there is an external path for electric current, and ceases when that path is broken. Being that the motivation for electrons to move through a cell is chemical in nature, the amount of voltage (electromotive force) generated by any cell will be specific to the particular chemical reaction for that cell type. For instance, the lead-acid cell just described has a nominal voltage of 2.2 volts per cell, based on a fully "charged" cell (acid concentration strong) in good physical condition. There are other types of cells with different specific voltage outputs. 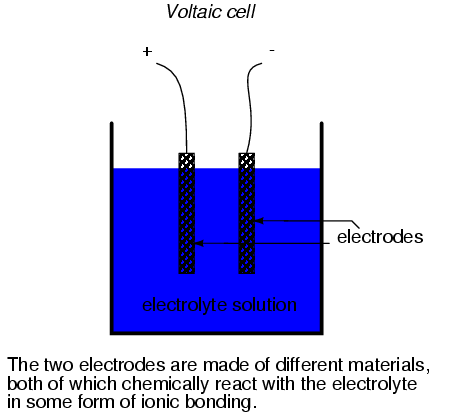 The Edison cell, for example, with a positive electrode made of nickel oxide, a negative electrode made of iron, and an electrolyte solution of potassium hydroxide (a caustic, not acid, substance) generates a nominal voltage of only 1.2 volts, due to the specific differences in chemical reaction with those electrode and electrolyte substances. The chemical reactions of some types of cells can be reversed by forcing electric current backwards through the cell (in the negative electrode and out the positive electrode). This process is called charging. Any such (rechargeable) cell is called a secondary cell. A cell whose chemistry cannot be reversed by a reverse current is called a primary cell. Atoms bound together by electrons are called molecules. 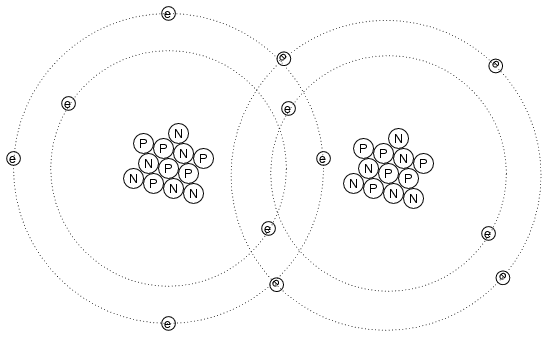 Ionic bonds are molecular unions formed when an electron-deficient atom (a positive ion) joins with an electron-excessive atom (a negative ion). Chemical reactions involving ionic bonds result in the transfer of electrons between atoms. This transfer can be harnessed to form an electric current. A cell is a device constructed to harness such chemical reactions to generate electric current. A cell is said to be discharged when its internal chemical reserves have been depleted through use. A secondary cell's chemistry can be reversed (recharged) by forcing current backwards through it. A primary cell cannot be practically recharged. 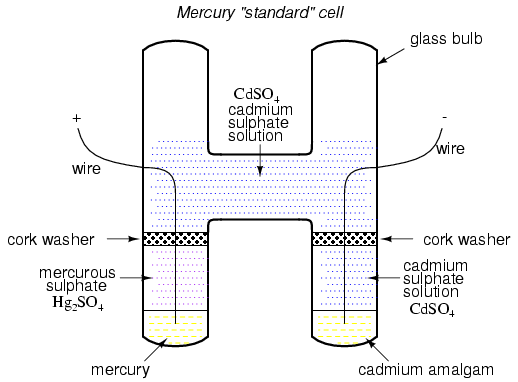 Lead-acid cell charge can be assessed with an instrument called a hydrometer, which measures the density of the electrolyte liquid. The denser the electrolyte, the stronger the acid concentration, and the greater charge state of the cell. The word battery simply means a group of similar components. In military vocabulary, a "battery" refers to a cluster of guns. In electricity, a "battery" is a set of voltaic cells designed to provide greater voltage and/or current than is possible with one cell alone. The real battery shown above within the dotted lines has an internal resistance of 0.2 Ω, which affects its ability to supply current to the load resistance of 1 Ω. The ideal battery on the left has no internal resistance, and so our Ohm's Law calculations for current (I=E/R) give us a perfect value of 10 amps for current with the 1 ohm load and 10 volt supply. The real battery, with its built-in resistance further impeding the flow of electrons, can only supply 8.333 amps to the same resistance load. The ideal battery, in a short circuit with 0 Ω resistance, would be able to supply an infinite amount of current. The real battery, on the other hand, can only supply 50 amps (10 volts / 0.2 Ω) to a short circuit of 0 Ω resistance, due to its internal resistance. The chemical reaction inside the cell may still be providing exactly 10 volts, but voltage is dropped across that internal resistance as electrons flow through the battery, which reduces the amount of voltage available at the battery terminals to the load. Because batteries create electron flow in a circuit by exchanging electrons in ionic chemical reactions, and there is a limited number of molecules in any charged battery available to react, there must be a limited amount of total electrons that any battery can motivate through a circuit before its energy reserves are exhausted. Battery capacity could be measured in terms of total number of electrons, but this would be a huge number. We could use the unit of the coulomb (equal to 6.25 x 1018 electrons, or 6,250,000,000,000,000,000 electrons) to make the quantities more practical to work with, but instead a new unit, the amp-hour, was made for this purpose. Since 1 amp is actually a flow rate of 1 coulomb of electrons per second, and there are 3600 seconds in an hour, we can state a direct proportion between coulombs and amp-hours: 1 amp-hour = 3600 coulombs. Why make up a new unit when an old would have done just fine? To make your lives as students and technicians more difficult, of course! A battery with a capacity of 1 amp-hour should be able to continuously supply a current of 1 amp to a load for exactly 1 hour, or 2 amps for 1/2 hour, or 1/3 amp for 3 hours, etc., before becoming completely discharged. In an ideal battery, this relationship between continuous current and discharge time is stable and absolute, but real batteries don't behave exactly as this simple linear formula would indicate. Therefore, when amp-hour capacity is given for a battery, it is specified at either a given current, given time, or assumed to be rated for a time period of 8 hours (if no limiting factor is given). For example, an average automotive battery might have a capacity of about 70 amp-hours, specified at a current of 3.5 amps. This means that the amount of time this battery could continuously supply a current of 3.5 amps to a load would be 20 hours (70 amp-hours / 3.5 amps). But let's suppose that a lower-resistance load were connected to that battery, drawing 70 amps continuously. Our amp-hour equation tells us that the battery should hold out for exactly 1 hour (70 amp-hours / 70 amps), but this might not be true in real life. With higher currents, the battery will dissipate more heat across its internal resistance, which has the effect of altering the chemical reactions taking place within. Chances are, the battery would fully discharge some time before the calculated time of 1 hour under this greater load. Conversely, if a very light load (1 mA) were to be connected to the battery, our equation would tell us that the battery should provide power for 70,000 hours, or just under 8 years (70 amp-hours / 1 milliamp), but the odds are that much of the chemical energy in a real battery would have been drained due to other factors (evaporation of electrolyte, deterioration of electrodes, leakage current within battery) long before 8 years had elapsed. Therefore, we must take the amp-hour relationship as being an ideal approximation of battery life, the amp-hour rating trusted only near the specified current or timespan given by the manufacturer. Some manufacturers will provide amp-hour derating factors specifying reductions in total capacity at different levels of current and/or temperature. For secondary cells, the amp-hour rating provides a rule for necessary charging time at any given level of charge current. For example, the 70 amp-hour automotive battery in the previous example should take 10 hours to charge from a fully-discharged state at a constant charging current of 7 amps (70 amp-hours / 7 amps). Now, if the battery discharges a bit . . .
. . . and discharges a bit further . . .
. . . and a bit further until it's dead. Notice how much better the battery's true condition is revealed when its voltage is checked under load as opposed to without a load. Does this mean that it's pointless to check a battery with just a voltmeter (no load)? Well, no. If a simple voltmeter check reveals only 7.5 volts for a 13.2 volt battery, then you know without a doubt that it's dead. However, if the voltmeter were to indicate 12.5 volts, it may be near full charge or somewhat depleted -- you couldn't tell without a load check. Bear in mind also that the resistance used to place a battery under load must be rated for the amount of power expected to be dissipated. For checking large batteries such as an automobile (12 volt nominal) lead-acid battery, this may mean a resistor with a power rating of several hundred watts. The amp-hour is a unit of battery energy capacity, equal to the amount of continuous current multiplied by the discharge time, that a battery can supply before exhausting its internal store of chemical energy. An amp-hour battery rating is only an approximation of the battery's charge capacity, and should be trusted only at the current level or time specified by the manufacturer. Such a rating cannot be extrapolated for very high currents or very long times with any accuracy. Discharged batteries lose voltage and increase in resistance. The best check for a dead battery is a voltage test under load. 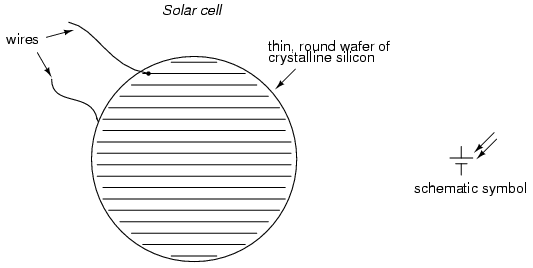 A solar cell uses ambient light energy to motivate electrons from electrode to another, producing voltage (and current, providing an external circuit). We know that the current is equal at all points in a series circuit, so whatever amount of current there is in any one of the series-connected batteries must be the same for all the others as well. For this reason, each battery must have the same amp-hour rating, or else some of the batteries will become depleted sooner than others, compromising the capacity of the whole bank. Please note that the total amp-hour capacity of this series battery bank is not affected by the number of batteries. We know that the voltage is equal across all branches of a parallel circuit, so we must be sure that these batteries are of equal voltage. If not, we will have relatively large currents circulating from one battery through another, the higher-voltage batteries overpowering the lower-voltage batteries. This is not good. When dealing with secondary-cell batteries, particular attention must be paid to the method and timing of charging. Different types and construction of batteries have different charging needs, and the manufacturer's recommendations are probably the best guide to follow when designing or maintaining a system. Two distinct concerns of battery charging are cycling and overcharging. Cycling refers to the process of charging a battery to a "full" condition and then discharging it to a lower state. All batteries have a finite (limited) cycle life, and the allowable "depth" of cycle (how far it should be discharged at any time) varies from design to design. Overcharging is the condition where current continues to be forced backwards through a secondary cell beyond the point where the cell has reached full charge. 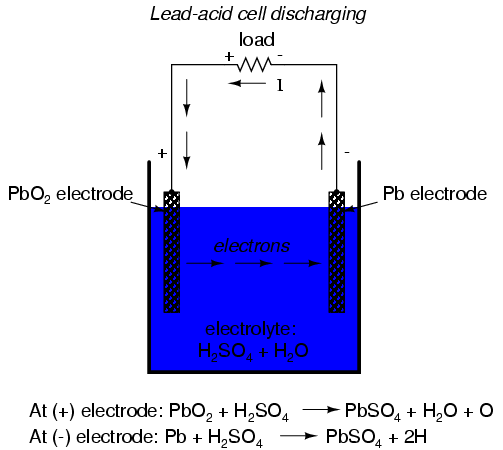 With lead-acid cells in particular, overcharging leads to electrolysis of the water ("boiling" the water out of the battery) and shortened life. 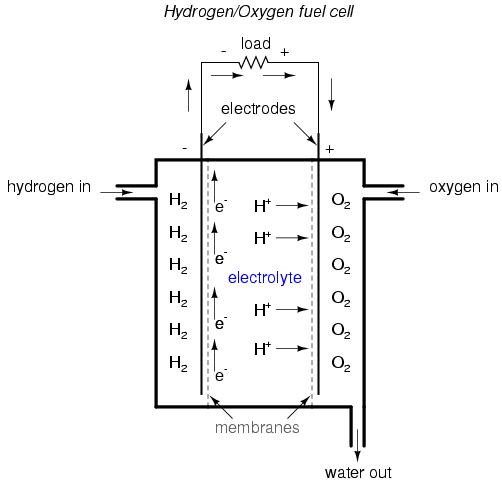 Any battery containing water in the electrolyte is subject to the production of hydrogen gas due to electrolysis. This is especially true for overcharged lead-acid cells, but not exclusive to that type. Hydrogen is an extremely flammable gas (especially in the presence of free oxygen created by the same electrolysis process), odorless and colorless. Such batteries pose an explosion threat even under normal operating conditions, and must be treated with respect. The author has been a firsthand witness to a lead-acid battery explosion, where a spark created by the removal of a battery charger (small DC power supply) from an automotive battery ignited hydrogen gas within the battery case, blowing the top off the battery and splashing sulfuric acid everywhere. This occurred in a high school automotive shop, no less. If it were not for all the students nearby wearing safety glasses and buttoned-collar overalls, significant injury could have occurred. When connecting and disconnecting charging equipment to a battery, always make the last connection (or first disconnection) at a location away from the battery itself (such as at a point on one of the battery cables, at least a foot away from the battery), so that any resultant spark has little or no chance of igniting hydrogen gas. In large, permanently installed battery banks, batteries are equipped with vent caps above each cell, and hydrogen gas is vented outside of the battery room through hoods immediately over the batteries. Hydrogen gas is very light and rises quickly. The greatest danger is when it is allowed to accumulate in an area, awaiting ignition. More modern lead-acid battery designs are sealed, using a catalyst to re-combine the electrolyzed hydrogen and oxygen back into water, inside the battery case itself. Adequate ventilation might still be a good idea, just in case a battery were to develop a leak in the case. Connecting batteries in series increases voltage, but does not increase overall amp-hour capacity. All batteries in a series bank must have the same amp-hour rating. 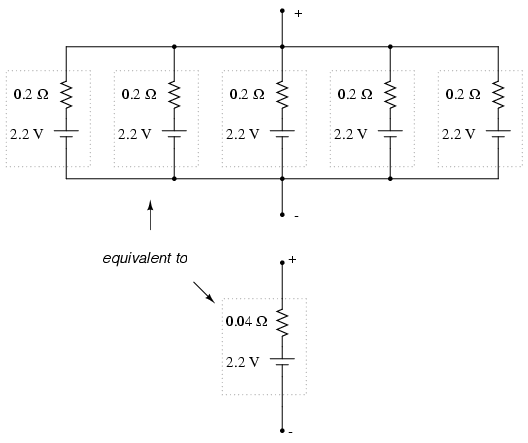 Connecting batteries in parallel increases total current capacity by decreasing total resistance, and it also increases overall amp-hour capacity. All batteries in a parallel bank must have the same voltage rating. Batteries can be damaged by excessive cycling and overcharging. Water-based electrolyte batteries are capable of generating explosive hydrogen gas, which must not be allowed to accumulate in an area.